Joe Fitzpatrick (27) of the University of Maine is tripped up by an Eastern Washington tackler during Saturday's Football Championship Subdivision national semifinal at Cheney, Washington. The third-seeded Eagles beat the seventh-seeded Black Bears 50-19. Andre Miller of Old Town is hoisted into the air by University of Maine teammate Michael Gerace (62) after catching a touchdown pass during the second half of Saturday's FCS semifinal game in Cheney, Washington. Eastern Washington beat UMaine 50-19. 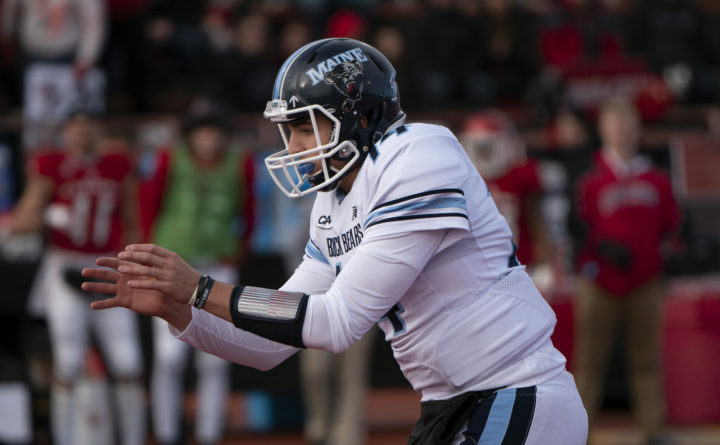 University of Maine quarterback Chris Ferguson waits for the snap from center during Saturday's FCS national semifinal game against Eastern Washington in Cheney, Washington. Ferguson passed for a career-best 325 yards, but the Eagles handled the Black Bears 50-19. Jaquan Blair (11) of the University of Maine is swarmed by Eastern Washington tacklers, including Calin Criner (left) and Nzuzi Webster (6) during Saturday's FCS semifinal game in Cheney, Washington. The Eagles defeated the Black Bears 50-19. The University of Maine’s unprecedented run to the Football Championship Subdivision semifinals came to a halt on Saturday. 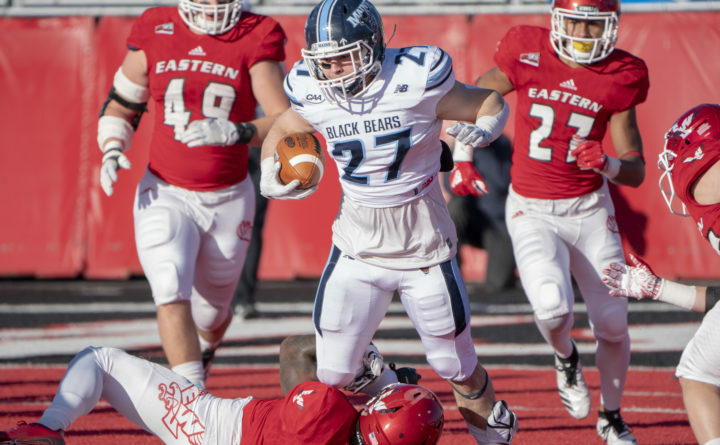 The Black Bears’ nationally-ranked defense was torched for a season-high 568 yards and redshirt sophomore quarterback Eric Barriere threw seven touchdown passes to lead third seed Eastern Washington to a 50-19 victory over seventh seed UMaine on the red turf at Roos Field in Cheney, Washington. Third-ranked Eastern Washington (12-2), winner of seven straight, plays top seed and defending champ North Dakota State (14-0) in the FCS championship game on Jan. 5, 2019, in Frisco, Texas. Eastern Washington went 8-0 at home this season. 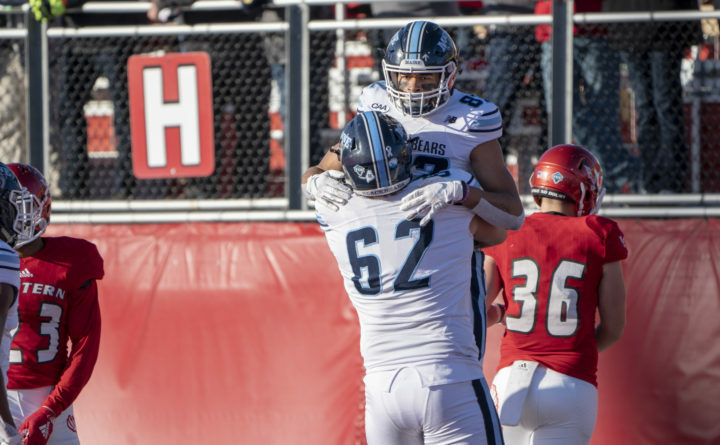 Twelfth-ranked UMaine (10-4) concluded its most successful season since the inception of the program in 1892 after having its six-game winning streak snapped. It was UMaine’s first ever trip to the national semifinals. UMaine turned the ball over four times while Eastern Washington had only one. “Whenever you are a plus-three in turnover margin, you are going to win; so says the numbers since 2010,” Eastern Washington coach Aaron Best said. The Eagles are 50-0 when they win the turnover battle, dating back to 2010. Barriere, who has played eight games in place of injured All-American Gage Gubrud, was the catalyst for an offense that churned out 22 plays of at least 10 yards, including nine of 20 yards or more. UMaine’s defense ranked ninth in the country in total defense (293.5 yards per game), but the Eagles (538.3 ypg) were firing on all cylinders. Barriere completed 21 of 30 passes for 352 yards and was protected superbly by his offensive line, which didn’t allow a sack against a defense that ranked second with 3.62 sacks per game. Thirteen of his completions netted at least 10 yards and six of those went for 20 or more. Wide receiver Nsimba Webster caught nine passes for 188 yards and four touchdowns. “Our offensive line came out here and did great today because they knew they had a tough challenge,” said Barriere, who also ran for 45 yards as the Eagles rushed for 216 yards. Sam McPherson had 64 yards on 12 carries to lead Eastern Washington. It was the most rushing yards allowed in a game this season by UMaine, which led the FCS in rushing defense (68.7 ypg) and had given up only 86 rushing yards in its two playoff wins. “Maine didn’t want me to get outside so that opened up a lot for our running backs,” said Barriere, who threw seven TD passes for the third time in his life. “With our style of [aggressive] defense, you have to win one-on-one matchups. We had been doing that. That’s the big reason why we’re here today. But [Eastern Washington] did a really good job winning those one-on-one matchups,” Harasymiak said. Eagle receivers did an impressive job getting open. Best was thrilled with his team’s performance. 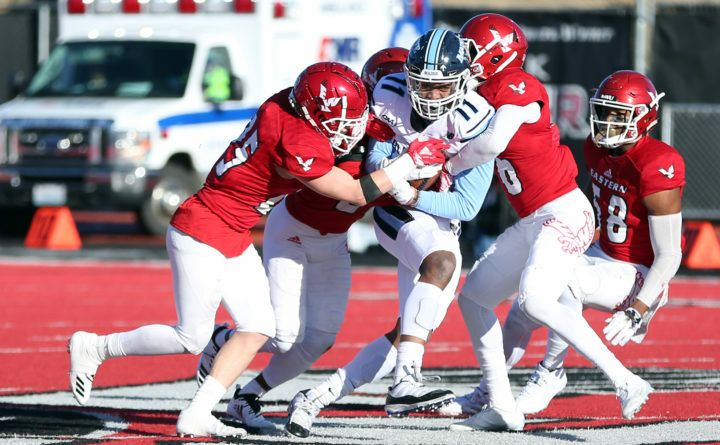 UMaine started the game in promising fashion with a 32-yard pass from Chris Ferguson to Micah Wright on the first play, but the drive stalled at the EWU 29 and Kenny Doak’s 46-yard field-goal attempt came up short. Two turnovers by Ferguson led to Eastern Washington’s first two touchdowns as the Eagles took a 28-0 halftime lead. On UMaine’s second possession, facing a third-and-10 at its own 7, Ferguson underthrew a pass intended for Jaquan Blair and Josh Lewis intercepted it and took it to the 1-yard line. On the next play, Barriere hit an open Andrew Boston for a touchdown. “It wasn’t just a huge momentum change, but it’s a huge momentum developer,” said Best. On the next possession, UMaine marched from its 25 to the EWU 39 but Ferguson dropped back to pass and had the ball knocked out of his hands by Keith Moore, who recovered the fumble at the 42. Six plays later, Barriere threw a 3-yard TD pass to Jayce Gilder. Ferguson completed 28 of 54 passes for a career-high 325 yards and a touchdown but was intercepted twice. An 11-yard TD pass from Barriere to Webster made it 21-0 with 11 seconds left in the first quarter and the two hooked up on a 16-yarder with 5:37 left in the half to cap a nine-play, 90-yard drive that took only 2:06. The Black Bears tried to claw their way back into the game. They got a safety on a bad snap and Doak kicked a 31-yard field goal, then a 47-yard touchdown pass from Ferguson to Old Town’s Andre Miller and a 2-yard scoring run by Joe Fitzpatrick of North Yarmouth offset a 9-yard TD pass from Barriere to Webster. UMaine was within 35-19 with 2:34 left in the third period. But 42 seconds after Fitzpatrick’s TD run, Barriere launched a 58-yard TD pass to a wide open Webster to all but sew up the win. He added a 29-yard pass to Gilder with 8:07 remaining. Dehonta Hayes had a game-high 13 tackles for Eastern Washington. Miller, who made seven catches all season, finished the day with a career-high nine receptions for 129 yards. Miller said it was cool to have a career day, but said he also failed to make some plays and the outcome outweighed his efforts. “We didn’t get done what we wanted to get done,” he said. Redshirt freshman Ramon Jefferson ran for 65 yards on 11 carries and finished the season with 1,037 yards. Blair made five catches for 71 yards and Wright (3 rec., 44 yds.) wound up fifth on UMaine’s career receptions (168) and receiving yards (2,233) lists. Taji Lowe’s nine tackles and eight each by Deshawn Stevens and DeVaughn led UMaine.